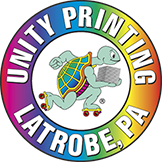 For over 25 years we have been serving Greensburg and the rest of Westmoreland County with offset printed products that you can count on to get your message across to your audience. We utilize proven technology and equipment to ensure that our printed products are of the highest quality. Our professional press-operators are masters at maintaining ink consistency and coverage, maintaining accuracy, and meeting tight deadlines. - We offer many options to fit your budget, don't just ask for a quote, explain your situation to us and we can come up with a solution!